Living by Faith is Ever Relevant! Trust in the Lord with all your heart, and lean not on your own understanding; in all your ways acknowledge Him, and He shall direct your paths (Prov. 3:5-6 NKJV). have spent more than half a century preaching, teaching, and emphasizing this wonderful Scripture passage. “Trust in the Lord” has been a favorite theme for my addresses to young people at high school commencements, youth camps, and retreats, along with personal chats with my children and grandchildren. Hopefully I have reflected some of the comfort and assurance this passage brings to daily living. I was about halfway into this life journey of mine when a good friend and older ministerial colleague, Frank Lemons, attempted to focus my attention on a different perspective. Frank mentioned that “time and experience, contrary to popular opinion, does not smooth life’s pathway, nor make one’s need for faith any less than when bubbling with youth and vitality.” In other words, the often-repeated scriptural maxim “The just shall live by faith” (Rom. 1:17) is ever relevant; and Frank put the emphasis on “live,” making it an ever-present demand. I have met others with similar attitude brought on by differing circumstances: children impaired by physical and sexual abuse, young people disappointed in a romantic relationship, mothers struggling with mentally and physically handicapped children, fathers fired from jobs into which they had given years of faithful service, ordinary people who stepped without warning into extraordinary circumstances and found themselves overwhelmed. These are the people and the problems pastors face week after week, and it is to these that pastors prayerfully and powerfully present Holy Spirit comfort found in the backside of trust. The bedrock of Christian faith remains “God is love” (1 John 4:8). Therefore, the backside of trust requires acknowledgment and acceptance of His will even in life’s dark moments of mystery. Our natural tendency, our human nature, is to relate easily and to rejoice with family number one (rightfully we should, for God is good). It is more difficult but equally important—perhaps we should say necessary—that we relate to family number two (God is still good) within the backside of trust. Unfortunately, we Pentecostals too often are prone to misuse or to misapply Paul’s admonition to the Romans, “For there is no respect of persons with God” (Rom. 2:11). The words are themselves beautiful. God loves everyone—all races, creeds, nationalities, young and old. When it comes to God’s eternal, all-surpassing love, grace, and mercy, He is no respecter of persons; but that in no way changes the fact that God wills and providentially directs each individual on a unique and personal path through life. In some lives the backside of trust may seem more glaringly displayed. The New Testament gives graphic example of this in the contrast between Peter and James, the brothers of John. Both were apostles. It is even implied that Peter, James, and John were favorites of the Lord, pulled aside by Him for prayer and on the Mount of Transfiguration. James was active in the early church, as recorded in Acts—the Day of Pentecost, those first revivals, and the rapidly growing church. Then we come to chapter 12, and read that Herod “killed James the brother of John with the sword. And because he saw it pleased the Jews, he proceeded further to take Peter also” (vv. 2-3). an angel to deliver him—one of the most beautiful and miraculous stories of the early church. Through faith and trust we easily rejoice, as did the saints in Acts, upon the deliverance of Peter, but we understand and accept the brutal killing of James only through the backside of trust. God did not love Peter more than James, but He had a different plan for each of their lives. I have enjoyed well over 50 years of ministry—the last 10 years, retired—and unquestionably, my latter years have differed from the early, middle, and so-called most productive ones. Like many, there are times when I yearn and dream and relish the past. Still, it remains just that— the past. Many tasks are yet unfinished. 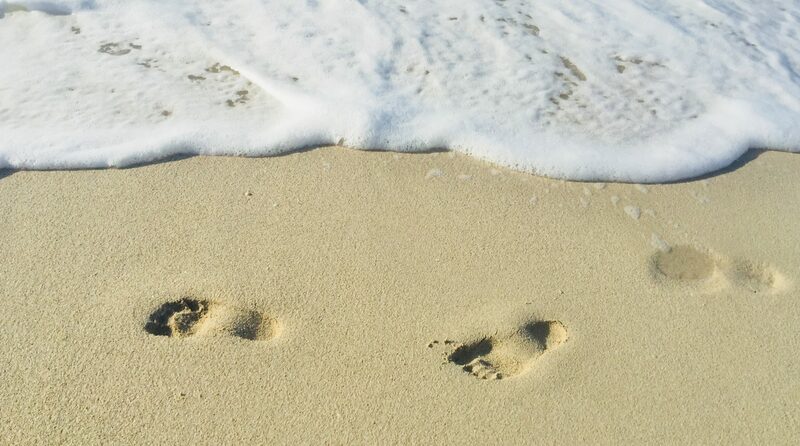 I hear some good things about my past, see a few notable markers, but know in my heart that things have changed, some of my works have tarnished, and many of my footprints have totally disappeared. Example: A church I helped build with my own youthful hands has been torn down. It’s gone. A small congregation is still there, but few remember my name. I thought I left some markers—as a youth director, an evangelism director, a pastor, a writer, and church administrator . . . but there is little for human eyes. Things change. Time obliterates, leaving only God’s records. So here I sit, my thoughts traveling back to Frank Lemons, and my heart thrilling from the backside of trust. God forbid that I worry about the markers, the earthly tracks of my life, when I can still trust the Lord and Savior of my life. It is now so obvious that those good decisions of my life were made by Him anyway, through His providence; and those avoided bad decisions of my life were stopped by His providential care. In short, I now live daily with the backside of trust, seeing through faith His hand upon my life past—the victories, the defeats, the changes, the disappointments, the excitement—just as I trusted Him step-by-step in the midst of the conflicts. What a wonderful truth it is! The final chapter yet to be . . . home-going . . . “well done” from the One who matters. Even on the backside of trust, His presence is warm and comforting.